“We build our relationship with Israel on the foundation of hundreds of years of coexistence of Poles and Jews under one Polish roof. We focus on economic and technological co-operation” – stated the Polish minister of Foreign Affairs Jacek Czaputowicz during his Exposé in the Polish parliament yesterday. According to Czaputowicz Poland and Israel need a culture of trust and cooperation. All very fine and good, but the problem is that such nice words meet with deaf ears in Israel. The trust-building process has been permanently disturbed by Israeli media, scholars and public officials who falsely accuse Poland of massive collaboration with Nazi Germany during the World War Two and who lessened Poland’s already-limited geopolitical stature. Few days ago, Eli Dukorski, the Mayor of Kiryat Bialik, an Israeli partner city of Radomsko, a town in central Poland, planned to commemorate Radomsko Jews who were killed at the hands of Nazi Germans. Dukorski meant to deliver a speech on his trip to Poland to Israeli high school students. He intended, however, to condemn Poles who allegedly killed 200,000 fugitive Jews and not to criticize the German perpetrators. Although there is no historical evidence that Poles committed such a crime, the fabricated numbers (originating from a controversial scholar Jan Grabowski of Ottawa University) are purposefully disseminated by Israeli media, the Israeli Ministry of Foreign Affairs and the Israeli officials like Eli Dukorski. Fortunately, the authorities of Radomsko didn’t accept this attempt to rewrite history and informally requested the Israeli side to agree on a more conciliatory nature of the Matzevah meeting that would bring together the youth from Radomsko and Kiryat Bialik. The Israeli Mayor then sought the advice of his Foreign Ministry, which stated: “We reject any attempt at censorship and support the mayor’s right to make his speech as planned and not omit any word, not even a single letter.” Actually, the Radomsko officials had never interfered in the content of the speech of Kiryat Bialik’s Mayor, but the Israeli Mayor cancelled his visit and the Israeli media absurdly accused Poland of censoring Dukorski’s speech. The Mayor of Radomsko Jarosław Ferenc was not about to take the reproach of Israelis and published a statement condemning the unfounded claims of censoring the speech of his guest from Kiryat Bialik. He wrote: “Following consultations at the Ministry of Foreign Affairs, we decided that we cannot interfere in the content of the speech of Kiryat Bialik’s Mayor who represents the administration of the State of Israel which has many ties and a strategic partnership with Poland.” He stated also: “The text (of Dukroski) featured descriptions of the tragic fate of Jews during World War II. It follows from the accounts that the murders and atrocities against Jews were committed by the Poles who murdered 200 thousand Jews in collaboration with the Nazis of no precise nationality. The stories that are quoted are of personal nature, so they should not be treated as a source of historical knowledge. They could no doubt be a subject matter of a debate between historians or of academic deliberations on the complex Polish-Jewish relations. Likewise, the numbers of the victims quoted in the address do not reflect the findings of most historians who deal with World War II. 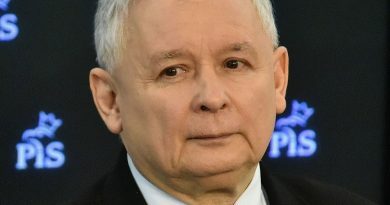 The theories outlined in the speech are challenged by many historians on the grounds of methodology and source study because they are not based on the research conducted so far.” Although the statement of the Polish Mayor was both in Polish and in English, the Israeli media didn’t deem it necessary to publish it. They accused the Polish Mayor of a censure but were themselves censoring his words. A similar historical revisionism for political purposes is not uncommon at Yad Vashem. During a recent visit of Polish Righteous to the Israel’s memorial to the victims of the Holocaust, one of the Polish guests spotted a photograph taken in the wartime Jewish Ghetto in the Polish city of Łódź. The description of the image placed by Yad Vashem spoke of “Polish police” watching the gate to the ghetto. Actually, there was no single “Polish policeman” in Łódź and the ghetto was managed by the Jewish councils and the Jewish ghetto police. The head of the Council of Elders in the Łódź Ghetto was Chaim Rumkowski, a Polish Jew and a ruthless Nazi collaborator. The Polish Secretary of State Jan Dziedziczak, who was among the Polish visitors, said: “When I saw this inscription, I asked for immediate intervention from our diplomatic mission in Israel… We will not leave this matter and we will do everything to change this information immediately.” In reaction to Dziedziczak words, the Israelis newspapers disregarded, however, his criticism and continued to spread the “Polish police” slur. 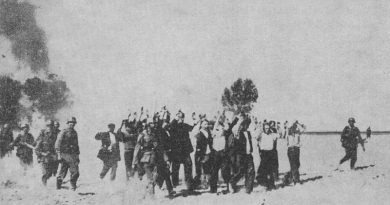 The Jerusalem Post reported: “The Polish police was employed “on a wide scale against the Jewish population,” Yad Vashem wrote, and “had an active role in policing ghettos in occupied Poland and searching for Jews who sought refuge with the local population after escaping from ghettos and camps.” The Polish police demonstrated “absolute devotion” to the Nazi authorities, according to Yad Vashem, “although a handful of cases of assistance to Jews by some officers also occurred.” In fact, the Polish police, called also Blue Police, was formed by Nazi Germany as an organization purposed to keep law and order in the General Government territory and not to guard the ghettos. In addition, the city of Łódź was far away from the General Government. Nazi Germany annexed Łódź directly to the new Warthegau region and renamed the city Litzmannstadt in honour of a German general, Karl Litzmann. There was no Polish police in Warthegau and the Governor of Reichsgau Wartheland, Arthur Greiser, embarked on a program of complete removal of the formerly Polish citizenry. The plan also entailed the re-settling of ethnic Germans from the Baltic and other regions into farms and homes formerly owned by Poles and Jews (Wikipedia). The article of Jerusalem Post is a heinous attempt to whitewash people like Rumowski and to shift the blame for his war crimes on Poles. Effraim Zuroff, a Jewish scholar known to the public as a “chief Nazi hunter” (one should ask why not a “chief Nazi Germans hunter”) attested the Eastern European countries in the aforementioned Israeli daily Jerusalem Post a “rampant spread of Holocaust distortion”. Zuroff wrote: In that respect, we must keep in mind the very significant historical fact that only in Eastern Europe did collaboration with the Nazis include active participation in systematic mass murder, and that the assistance of local killers in the region was a critical factor in the enormous scope of the Shoa. The word “only” means nothing else but a Holocaust distortion and a disrespectful attempt to shift the blame for extermination of Jews on countries like Poland. In Dutch-speaking Flanders, the Flemish National Union, an authoritarian party, became a major part of the German occupation strategy and VNV politicians were promoted to positions in the Belgian civil administration. Léon Degrelle was a Belgian politician and Nazi collaborator, who founded Rexism and later joined the Waffen-SS. In the Netherlands, thousands of Dutch volunteers joined the 11th SS Volunteer Panzergrenadier Division Nordland. The French government sent willingly thousands of Jews to Auschwitz and Treblinka. Directed by René Bousquet, the French police helped in the deportation of 76,000 Jews to the extermination camps. In 1995, President Jacques Chirac officially recognized the responsibility of the French state for the deportation of Jews during the war, in particular the more than 13,000 victims the Vel’ d’Hiv Roundup of July 1942. 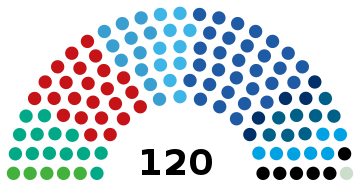 In Norway, the national government, headed by Vidkun Quisling, was installed by the Germans as a puppet regime during the occupation. Quisling encouraged Norwegians to volunteer for service in the Waffen-SS, collaborated in the deportation of Jews, and was responsible for the executions of members of the Norwegian resistance movement (Wikipedia). There was no such a collaboration in Poland, but for the revisionist Zuroff “only in Eastern Europe did collaboration with the Nazis include active participation in systematic mass murder (of Jews)”. In his story for the Israeli daily there was also no word about the Jewish ghetto police, the Jewish councils or the Jewish kapos. This explains why Zuroff had never protested when the global media wrote about the “Polish death camps”. The disrespectful statements made by people like Zuroff, Dukorski or those who call themselves journalists are flagrant attempts to blacken Poland and to enforce a dominant pseudo-historical narrative which has nothing to do with historical facts and the culture of memory. In such a poisoned atmosphere, a culture of mutual trust and respect, and a culture of cooperation and reconciliation, cannot possibly flourish. The dreams of a renewed fruitful coexistence of Poles and Jews under one Polish roof seem to be nothing more than a sweet illusion for some Polish officials who believe that they can expect their dinner from the benevolence of the butcher, the brewer, or the baker. Image: A Jewish policeman in Ghetto in Litzmannstadt. Source: Wikipedia.